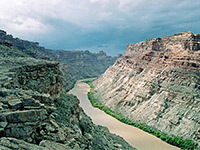 Canyonlands National Park covers a vast area of rock wilderness in southeast Utah, centered around the confluence of the Green and Colorado rivers. Over millions of years, the rivers and their small tributaries have carved the flat sandstone rock layers into many amazing forms with a wide range of colors. The 530 square miles of the park contain countless canyons, arches, spires, buttes, mesas and a myriad of other spectacular rock formations. The Grand Canyon may be deeper and more dramatic at first sight, but Canyonlands National Park has greater variety, both in the types of geological formations and the possibilities to explore them. It is certainly much easier to find solitude and isolation. 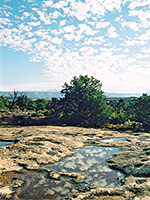 The Canyonlands area was only designated a national park in 1964; before this most of the terrain was unvisited, and also largely unvisitable. Much still is, since although there are paved roads, the only satisfactory way to see most of the park is by overnight hikes or by 4WD vehicle and even then the tracks are often very rough, and huge areas have no roads at all. As a result, far fewer tourists come to this national park than to others in Utah, although visitation is steadily increasing. The sheer unbridgeable canyons of the Green and Colorado rivers divide Canyonlands into three distinct sections (see map) - Island in the Sky, The Needles and The Maze - which differ in the types of landscape found there, the number of visitors and the available facilities. Travel between these three is necessarily difficult, requiring several hours driving. Also quite remote, the separate Horseshoe Canyon unit of the park contains many fine Indian pictographs. The northernmost district, Island in the Sky, is a high, wide plateau with commanding views across many miles of deep red rock canyons to the west, south and east. There are many overlooks, either beside the road or along short paths, and a good selection of hiking trails; some lead to places on the mesa top, while others descend the cliffs and reach the Green and Colorado rivers. 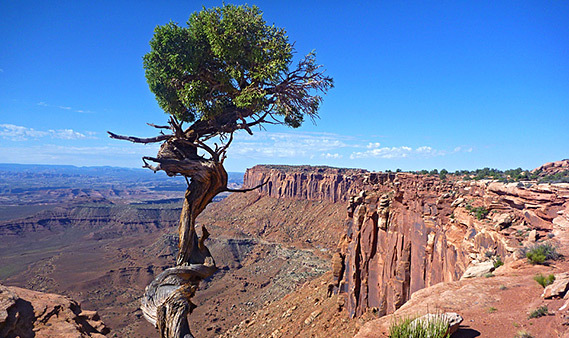 Good, elevated views of the White Rim, Monument Basin and Gooseberry Canyon. The second most popular section of the national park is The Needles, in the southeast; lower in elevation and with shallower canyons than the Island in the Sky but exposing a greater variety of rock formations. The Needles offers many opportunities for exploring and camping, and away from the entrance road, the area is little visited. 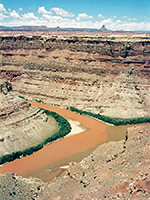 The Maze section of Canyonlands, west of the rivers, is the wildest and remotest section of the national park, and possibly of all Utah. 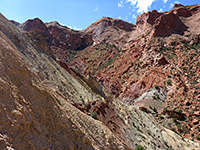 It is reached by first driving 50 miles along dusty unpaved roads starting from UT 24 between Hanksville and Green River, across relatively flat and completely uninhabited terrain to Hans Flat Ranger Station (as described in the route to the Blue John slot canyon). Beyond here, the roads deteriorate as the canyons approach; the Maze sits at the foot of the Orange Cliffs, which present quite a barrier to cross-country travel, but there is one entrance route (the Flint Trail), which is for 4WD vehicles only. The Maze itself is a jumble of six steep inhospitable canyons plus countless smaller ravines, centered on a vast area of convoluted fins and pinnacles known as Land of the Standing Rocks. The most popular trails (all unmaintained) are along Jasper Canyon, Shot Canyon, Water Canyon and several forks of Horse Canyon. 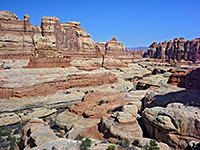 Surrounding the Maze are other remote areas of rock with yet more canyons and arches, buttes and domes, especially to the southwest, on land which is part of Glen Canyon National Recreation Area. 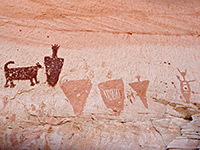 Horseshoe Canyon is a detached unit of Canyonlands National Park, northwest of the Maze on the west side of the Green River, and contains a five mile section of the deep box canyon of Barrier Creek, where many Indian pictographs were painted on rock walls around 3,000 years ago. 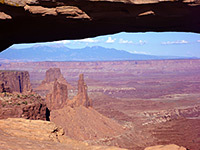 The best choice of accommodation when visiting Canyonlands is in Moab. Other nearby towns with hotels include Green River in the north, Monticello and Blanding in the east.